Boil water and cook and drain pasta. Put half the butter in a saute pan and turn to medium high. When butter foams, add ham, turn 2-3 times, then add spinach and liberal pinches of salt--the spinach needs it for flavor. Turn to high and saute spinach, turning frequently, for about 2 minutes. Remove from heat and mix in nutmeg, grated or powdered (no more than 1/8 tsp). 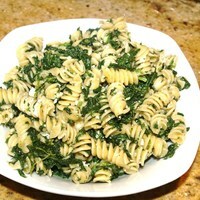 Toss the pasta with the contents of the pan, plus the ricotta, the remaining butter, and the 1/2 cup Parmesan cheese. Serve with salad, warm bread, and Parmesan and Pepper on the side. I filed this as Vegetarian too because it tastes great with or without the ham. If you leave out the ham, I would recommend extra spinach, a little extra kosher salt and freshly ground pepper at the end, and possibly extra ricotta. This was great! It'll be come a staple in our family repertoire too. My husband & I also enjoyed it with red pepper flakes on top. I've enjoyed making a few of your recipes. The African Peanut Chicken stew was a hit with our guests too. This was great! It'll be come a staple in our family repertoire too. My husband & I also enjoyed it with red pepper flakes on top. I've enjoyed making a few of your recipes. The African Peanut Chicken stew was a hit with our guests too. Delicious and easy! My kids love this and so do I. I'll typically cook extra ham and give it to my kids while loading my husband (largely vegetarian) with extra spinach. It is always in demand the next day as well! Jacki made this the other night, veggie style, with a ton of fresh spinach. It was great. I changed this recipe up a little to my liking. Instead of ham, I used sliced mushrooms and sauted them in a combo of 1/2 olive oil and 1/2 butter. I also included garlic powder to taste and red pepper flakes to taste for a little kick. Maybe next time, I will add some toasted pine nuts. John, Thank you for sharing this!!!!!! My 7yr. old told me its his new favorite and that we have to have it once a week! :) I said you may get tired of it, he said ok once every 2 wks then. We love this pasta! I did add more ham and ricotta then called for and I put onions in w the spinach and ham. It is just the best! Thanks for a new family favorite! When I first looked at the recipe I thought maybe I will change the ham to shrimp, but after tasting it the ham adds such a wonderful flavor, I will only make it this way!! Making this soon though, I'll substitute the Ham with grilled chicken breast , we're not pork eaters. Sounds great! Thanks for this recipe. I am definitely going to try this soon. It sounds wonderful and tasty. Can't wait to do this! One I'll be trying for sure! Hope you enjoy it and post a review, Infinity! I'm trying to break out of my chicken habit...this sounds like a wonderful new ham recipe! !